Guided tour of the Lucas, Chifley or Imperial Cave. Children aged up to 15 years may pay the child price. Please note the times listed are approximate and ALL bookings MUST be reconfirmed with operator the day before departure. 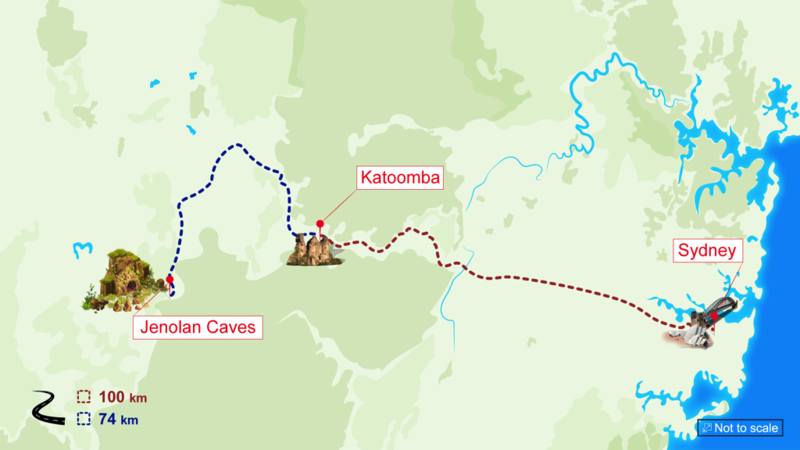 Discover the World Heritage treasures of the Blue Mountains and the breathtaking natural wonders of the Jenolan Caves. Nestled on the western side of the Blue Mountains, this extensive network of limestone caves and above-ground arches are Australia’s most impressive. Pass by the Sydney Olympic Pak at Homwbush Bay. Climb the western mountain highway via the sleepy townships of Blaxland, Wentworth, Lawson and Katoomba, the quaint capital of the Blue Mountains National Park, a getaway destination for holiday-makers. Enjoy a morning stop at Echo Point and see the Three Sisters rock formation. With views over stunning the Jamison Valley's eucalypt forests and the famous rock formation, why not pick up a take away lunch from one of the many cafes there (own expense). Travel through the scenic Blue Mountains region and learn about ancient Aboriginal Dreamtime interpretations of the creation of the world. Before you return to Sydney, you'll stop to admire the beauty of Blue Lake - a body of sapphire-coloured water that has gained its spectacular tint as a result of the minerals from the Jenolan Caves. This spot makes for amazing photo opportunities and is often the site for wedding photography, such is its beauty. A great photo opportunity. At the end of the day (approx. 7:15pm), you'll be returned to your Sydney accommodation or Star City Coach Terminal.